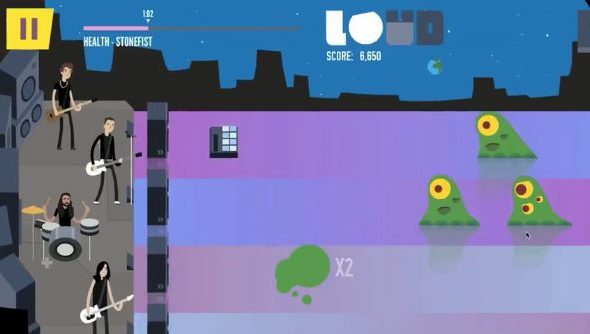 Loud on Planet X is a new rythm action game that has you battling beasties with perfectly-timed inputs while listening to modern indie darlings as they jam on-stage. This may feature some of the best indie bands, but what about the best indie games? Loud on Planet X looks like a weird Plants vs Zombies/Guitar Hero crossover with a stylised, high contrast art style. The rhthm action game features talent such as Little Dragon, Tegan and Sara, Purity Ring, HEALTH, METZ, Metric, Lights, July Talk, F*cked Up, Cadence Weapon, Austra and more. “LOUD on Planet X features some of the best indie artists in today’s music scene and the addition of Chvrches, Little Dragon and HEALTH make the already incredible lineup even stronger,” said Alex Jansen, founder of Pop Sandbox. You can defend your stage from quirky aliens with strobe lights, speakers, fog machines and amplifiers from today, as it’s available on Steam now for $7.99.